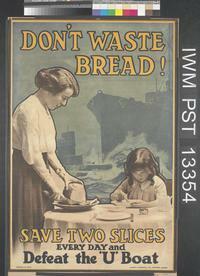 HomeAusterity Britain in 1914-15: from war economy to radium bread. Economy in the sense ‘careful management of resources, so as to make them go as far as possible’ was. of course, already well-established (the OED traces evidence of relevant use to 1670). It would nevertheless, as Clark observed, emerge as yet another ‘catch-phrase’ of the war, often being made part of a wider rhetoric of sacrifice by which individuals could be seen to ‘do their bit’, and integrated alike into government advice and popular advertising. “Study economy and health’ was, as one advertisement proclaimed, a particularly appropriate ‘Maxim for War-Time’ — a premise realised in this instance by the injunction to drink ‘Pure Indian tea‘. Further emphasis was provided by the topical pun deftly aligning maxim in the sense ‘a pithy saying, expressing a general truth’ and maxim as ‘a machine gun’. HP sauce was, in another advertisement (here from November 1914), proclaimed as ‘the most pleasing war economy’ — as well as ‘the most delicious and economical of all’. “The cry “economy” originated in the increased cost of food-stuffs at the beginning of the war, became a parrot-call on the part of mouthing politicians and frothy newspaper leader-writers, and was intensified by the heavy taxation imposed by the 1915 budget’. ‘If you want “Economy” without discomfort give up that Butter habit and try the “Romo” margarine way’. The inverted commas which frame economy signal its specific connotations in a time of war. Butter habit, as Clark notes, is another distinctive construction, replete with the moral pressures that appeals to economy could invoke. Formed by analogy with the kind of cigarette habit discussed in an earlier post. Its connotations reside in the sense of a now uncalled-for luxury and extravagance, as well as wilful expense. “Doing one’s bit” calls for restraint, and self-imposed moderation. With the exception of salmon, the humble salt herring has the highest food value. Many of the cheaper kinds of fish and the cheaper parts of fish may be used for fish puddings, fish cakes, kedgeree, etc. and those dishes would have additional “fuel” value from the potatoes, rice, or breadcrumbs mixed in with them. Radium had been deemed potentially ephemeral and excluded as a result from the relevant fascicle of the OED (it was added in 1933, along with radio-active and related words). Clark’s emphatic engagement with the details of history and language – and the value of what otherwise might, as he argued, be lost — can, as here, offer information of surprising interest and value. Radioactivity as a component of food, water, and medicine assumed an unexpected popularity in Edwardian England (as well as elsewhere). The scientific premises behind radioactivity as raising agent seem, however, extremely doubtful, and I have been unable to locate evidence outside the archive on radioactive bread as commodity in 1915 …! The two uses of ‘war-economy’ are interesting and of course the domestic one is arguably the one truest to the Greek roots of the word. There is an interesting tension running through 1914-15 between the macro imperatives of the British economy and the moral climate. Lloyd George as Chancellor of the Exchequer gives a speech at the start of the war encouraging ‘Business as usual’ which in todays language is about restoring consumer confidence. The start of the war had seen domestic trade collapse and a massive rise in unemployment, so this was a serious point. British strategy to some extent depended on the economy operating normally and yielding tax revenues that could then be loaned to Britain’s continental allies ( who it was assumed would be doing most of the actual dying). But this quickly runs up against a counter current that demands that civilians be seen to be making appropriate sacrifices. To some extent a campaign against waste provides a squaring of the circle- good spending can continue whilst bad spending is cut. Reduction of imports clearly made sense to free up shipping, so for example wholemeal bread which used grain more fully than white bread reduced Britain’s heavy dependence on wheat imports. By mid-1915 military recruiting had eliminated unemployment and had indeed created a labour shortage (hence things like ‘women’s right to serve’) But a further effect of full employment was to improve the bargaining position both individual and collective of the working class. This threatened to push up wages which in turn in a situation of limited imports would push up prices by classic supply and demand mechanisms ( and indeed by the end of 1915 prices are up 50% + on pre-war levels) . At this point and for the rest of the war the two uses of war economy begin to align, largely around pressuring the working class to control their consumption and also constraining their wages in 1915-16.